This is a Middle Eastern bread which is usually served with dips like Hummus, Baba Ganoush . Pita pockets with Falafel make a delicious snack too. You can make the pitas plain or with Zaatar flavour. 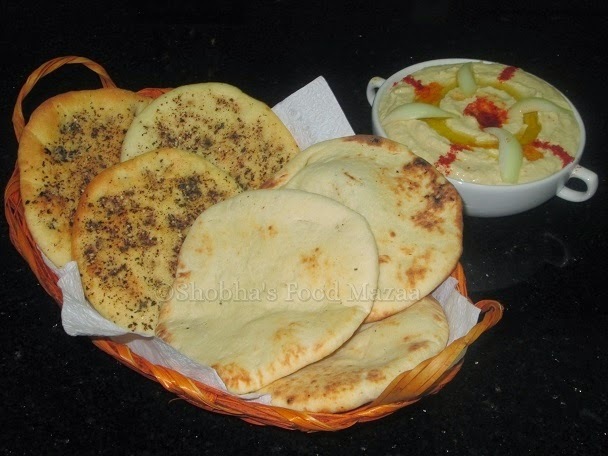 Pita bread is easily available in the supermarkets these days but nothing can beat the home made ones. It is very easy process and you can make the breads and store them too. They stay good for about a week in the refrigerator. You may even freeze them for later use. 1. Take the flour in a big bowl. 2. Make the water lukewarm. Spoon in the sugar and sprinkle the yeast on top without stirring. Leave in a warm place for 5-7 minutes or until it is frothy. 3. Make a well in the flour and slowly mix the yeast. Add the salt at this stage and also the oil. Knead to a soft dough adding a little more water. 4. Place the dough in a bowl covered with a cling film or a foil until it is risen and is double in size. 5. Knead the flour again with light hands and divide into 6 or 8 equal size portions depending on your preference. 6. Meanwhile pre-heat the oven placing a greased baking tray inside. 7. Roll out the pita using a little olive oil for rolling. If you want Zaatar pita then you sprinkle the zaatar powder and a little olive oil on the top surface and spread evenly. 9. For zaatar pitas you can light the top grill and keep for a few minutes to give a lightly roasted texture. 10. For the plain pitas what you have to do is holding them with tongs, flip them on the gas flame a couple of times to get the perfect colour and texture. Note: If you want to make pita pockets just cut the plain pitas into 2 halves and fill them with falafels,and the required ingredients. Check out the links given below how to make them. love that flavor ones, plain is also good. Never made pita bread before so i am looking forward to trying your recipe.